I never knew this existed. Now that I do, I am starting training. Wait, nevermind. This changed my mind. Would you ever free dive into an abyss? Have you ever come across a project and thought, “yup I have to do that immediately”? That is exactly how I felt when I saw Ashley’s coasters. If you have ever done a DIY project you probably already have ninety percent of the supplies. Painters tape, check. Paint, check. Some feisty gold spray paint, check. 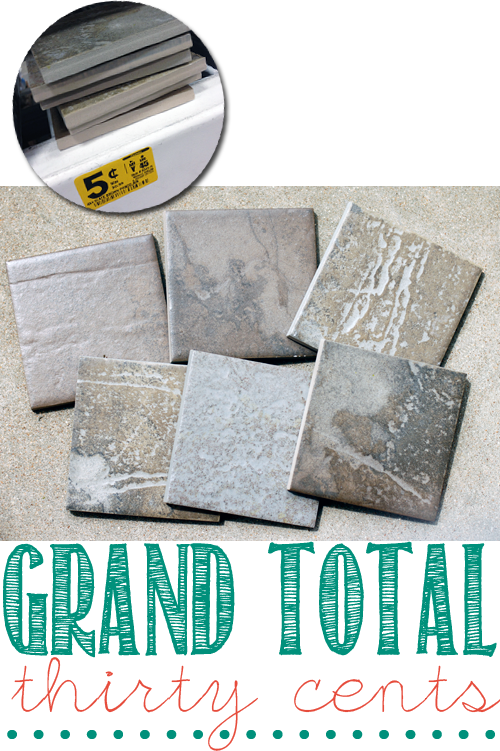 If you have tiles, well then you are all set. We had to go pick up that last one, but check this out. You got it, this whole project cost us a whopping thirty cents. That is a DIY deal if I have ever seen one. A little paint, a little patience and you get these pretty little souvenirs. Check out the full tutorial here. Enough shameless self promotion, while looking around the house for things to spruce I heard a whistle. I looked around my kitchen and then heard a yelp. Then there was some sort of crashing boom and the refrigerator caught my eye. Well, what once was our fridge at least. Lately, it has become a scrapbook of sorts. Please don’t look too closely or you will see two-year old Christmas cards, I can’t help it my friends have cute kids. I lovingly took all those sweet cards and announcements down and tucked them in a memory box. I also made a resolution to take down Christmas cards before the Fourth of July. To help keep the fridge looking classy I decided our magnets needed a little makeover, I mean I already had the paint out so why not. 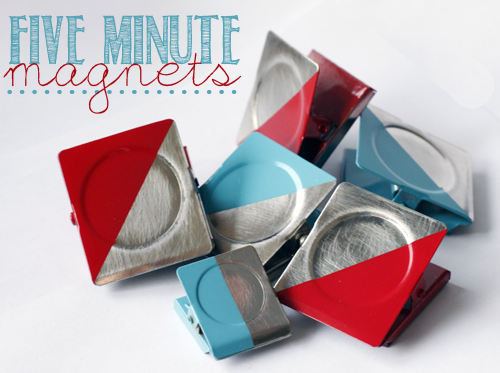 I took our boring silver clasp magnets (because they hold like a boss) and gave them a rocker edge. Tim likes them because he thinks they look like little nautical flags but I say Mick Jagger would be proud. 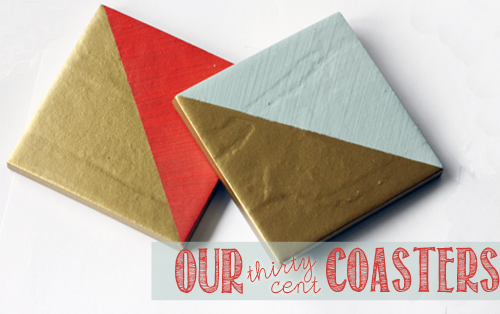 A little Frogtape, a couple thin coats of color, and voila….a whole new look. I promise to keep that fridge clean and whistle at it before it has to yelp at me. 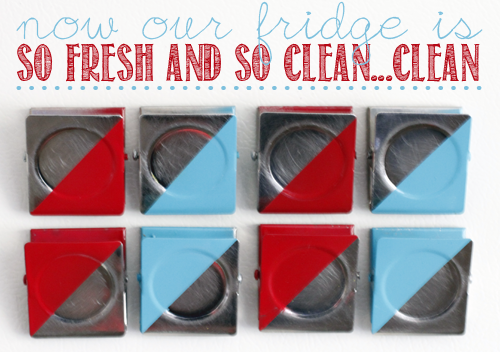 Do you have matching magnets? 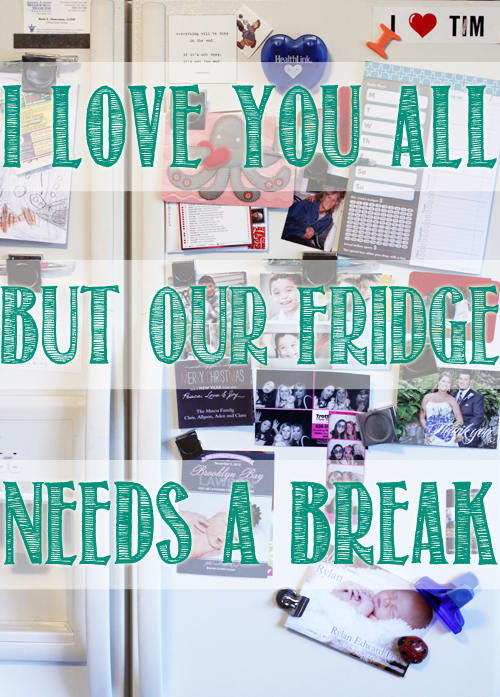 Is your fridge plastered in cards and momentos? Got any crafts for all those announcements? I hope you all had weather as pretty as we did here in Missouri. Tim & I worked until every muscle in our bodies gave out to take advantage of the sunny skies and cool breezes. I am sore y’all. I can’t even lift my hand without all my muscles protesting their very existence. I am going to start working out….tomorrow. For today I will just bust out the Icy Hot and make our Monday mission an easy one. Did you know that a burglary occurs every fifteen seconds? That means in the time it takes you to read all this jibberish, there will have been about 10 robberies. Over half of those robberies happen during the day. Don’t mind me I am just sitting at work right now worrying about those statistics. I personally tend to be a worrier, so doors are locked and alarms are set and dogs are on guard. So this came as a surprise to yours truly, a whopping 32 percent of robbers just walk in to burglarize you. Yes, they just jump in your open window or stroll right through that front door you ol’ trusty Rusty. I know there are a lot of wonderfully fantastic people out there, but there are also plenty of people with their eyes on your flat screen mmmkay. Just lock up my friends, that’s all I am sayin. Wait, I lied that’s not all I’m sayin. Keep yourself safe first, but keep an eye out for your neighbors too. 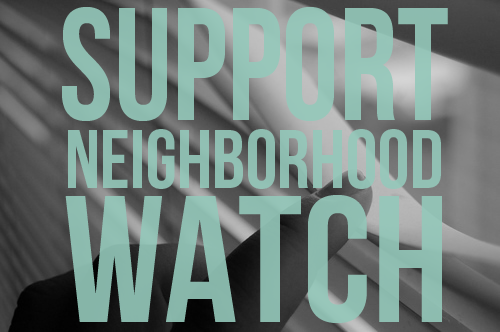 Look for suspicious activity, maybe even join Neighborhood Watch and put one of those nifty signs in your window. Talk to your neighbors, bake them cookies, and let them know when you’ll be out-of-town so they can keep their eyes peeled. Tim & I have been working hard at getting friendly with our neighbors and attempting to bring back that sense of community that we remember from our flashlight tag days of yesteryear. Although there have been no cookies baked yet. Have you ever been robbed? I have…twice! Have a great sense of community? Any tips on how to be a better neighbor? That girl is wise beyond her years. Can we talk about the fact that it is April, and not just April…it is mid-April. Seriously, wasn’t I just hunkering down for the end of the Mayan Calender with my jar of peanut butter and flashlight? Where is time going, and why aren’t all these projects finishing themselves. This weekend we are going to be kicking some home-sweet-home rump, but before I get all sweaty and exhausted let me revel in this sweet little Etsy shop. 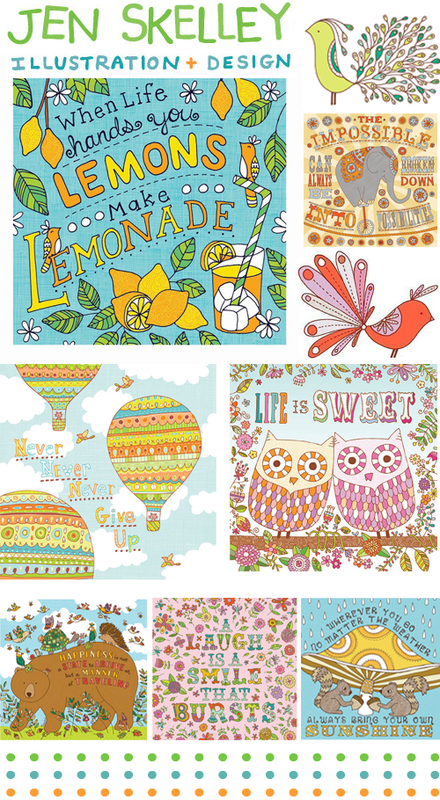 Jen Skelley’s sweet prints easily caught my eye with all the vibrant colors and whimsical characters. You put a whale on just about anything and I pretty much call you my soul mate. How adorable would a grouping of those be in a playroom? Along with everything Coachella, I was also able to find some pretty sweet DIY projects. I can’t wait to get my hands on some of these and make them my own. 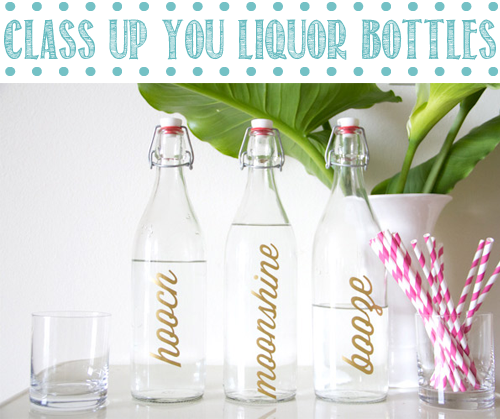 I have been keeping my eyes peeled for a sweet little bar cart that I can refurbish, and when I find (or build) my dream companion you had better believe a few of these DIY bottles will be riding dirty on top. Look, we are young and fairly broke so we can’t afford the “bottles” you see in those rap videos. Our bottles are generally of the plastic variety, so giving them a little makeover might be good for our bar carts reputation. I am getting a little overly excited for Cinco de Mayo, it is one of my favorites. Okay, I really enjoy nachos and salsa and maybe a tangy green drink (on the rocks, extra strong). 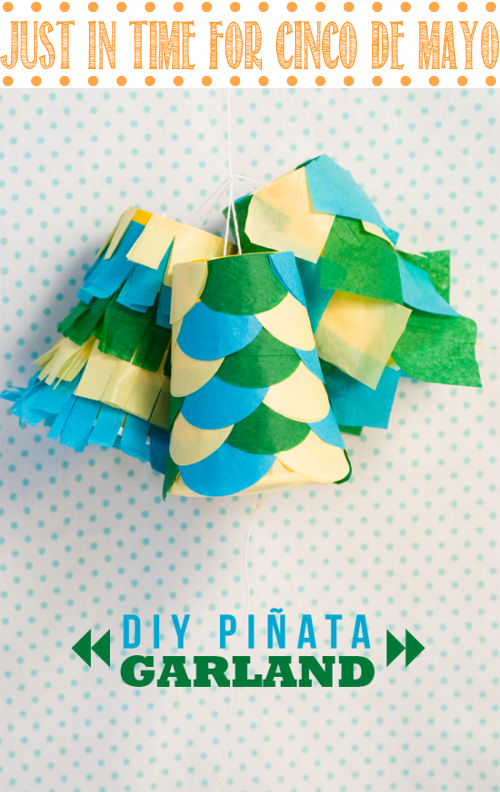 The adorable little pinatas that One Charming Party whipped up are getting me in the fiesta spirit. These look like they would be super easy for kiddos to pull too, so instead of giving that neighbor kid that murders ants with a magnifying glass a giant stick to terrorize everyone with just put up a couple of these and watch everyone go wild. Talk about unexpected. I have seen a lot of cool sunglasses, but these are taking the cake right now. 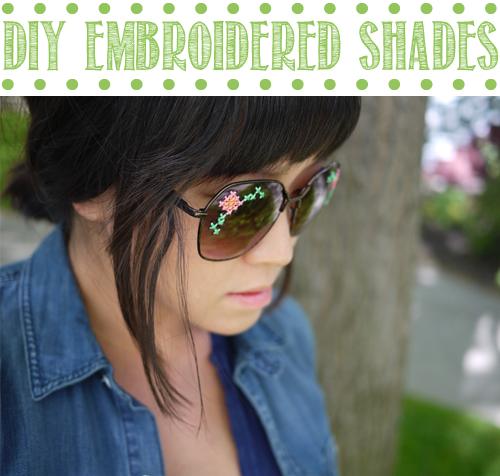 Erica from Honestly WTF actually drilled holes in her shades to embroider an awesome little design. She even makes it look easy. I must admit I have gone a little embroidery crazy. Maybe it is my inner granny, or maybe it is because I can’t embroider beans but I think I like it. I am excited about this, it is one of those things you don’t really need but it makes your day a little bit better. 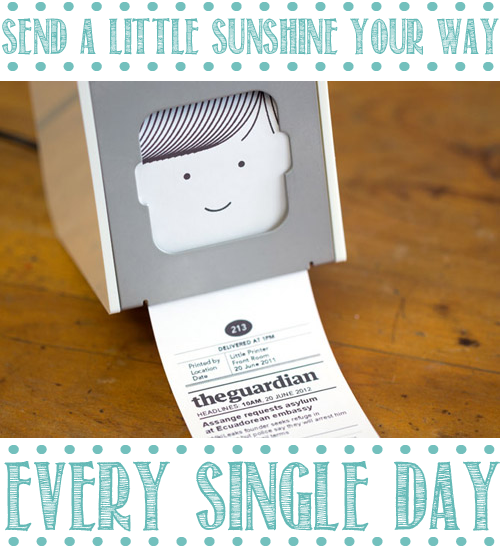 You buy this customizable printer and chose what is sent to you daily. It can be news updates, grocery lists. Sudoku puzzles, or even your astrology report. Imagine grabbing you morning horoscope before heading out the door, or even better sending yourself little love notes since it is all manageable from your cellular. I don’t even think my explanation does this little guy justice, so check it out here. Now what is my excuse for absolutely “needing” one of these? What did you find out there this week? Wanna come help us clean? 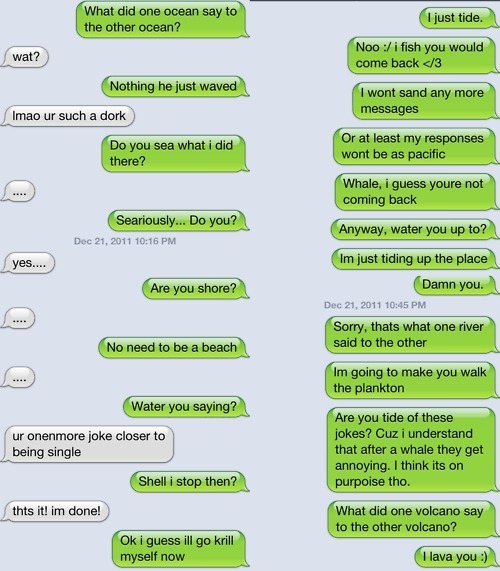 You heard that right…one time I texted T this entire joke and pretended I made it up. Eventually I told him the truth and he admitted how impressed he was that I was so witty. You should try it, fun for all. This time I will give credit where credit is due. 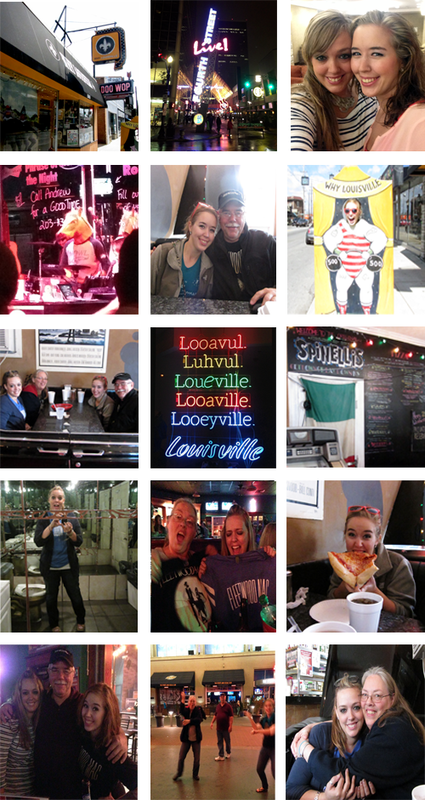 You may remember that Louisville, Kentucky was our first stop on our East Coast Road Trip. I declared my love then, and fell even harder this time around. For Christmas I got my family tickets to go see our favorite band, Fleetwood Mac. 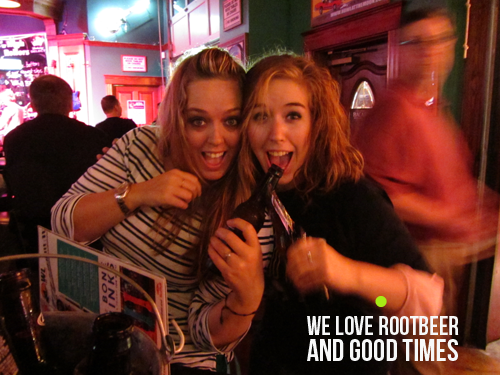 Unlucky for us, no one ever deems Missouri a great venue for rocking out. So I decided a family road trip was in order to check a box on our bucket lists. I grew up traveling with my family, and our trips are always at the top of my awesome-memory bank. As we grew older and went through the “can my friend come” and eventually “can my boyfriend come” stages of life the trips became rare. I miss those family trips more than I miss Zach Morris, sometimes I hate growing up. Throw in three members of our family going to school for a couple of years and you have quite a scheduling conflict, but somehow we made it happen. 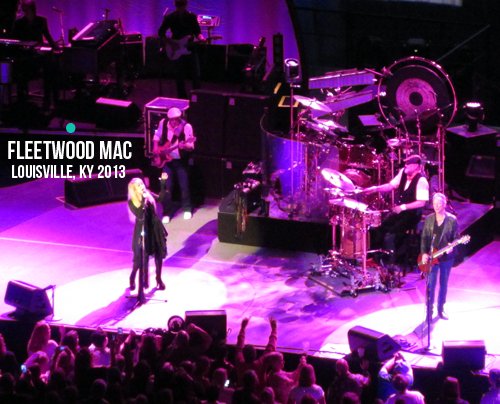 Call it a testament to our love for Fleetwood Mac. I suppose you could also say we actually like spending time together. Gramma look away, there may have been a teensy bit of drinking going down. Ready for a photo-throwdown…. Please check out the bottom picture in the center, my mother was teaching my dad how to Gangham. Aren’t you sad you missed out on that. The concert was fantastic, Lindsey Buckingham is my hero. 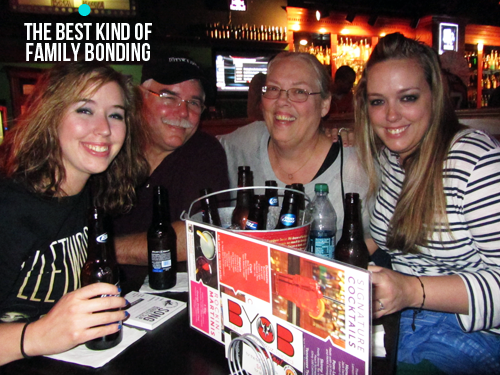 Afterwards, we took our high (of the music variety, no illegal drugs in our veins) down the road to Fourth Street Live. We stopped in at the piano bar Howl at the Moon, where they successfully sang Nikki Minaj and Tupac. It was impressive. If you follow us on Facebook you caught a glimpse of the horse playing drums….which made the night fantastic. Even though whilst powdering my nose I encountered a group of super-excited bathroom goers that couldn’t have told you who Fleetwood Mac was if you were holding a bottle rocket to their head. Look, if you have never karaoked “Sings a song it sounds like she’s singing…ohhh babay ohhh baby ohhh” well then I feel bad for you son. At the end of the night, my mom realized that we hadn’t eaten since 1 p.m. and declared a state of emergency. 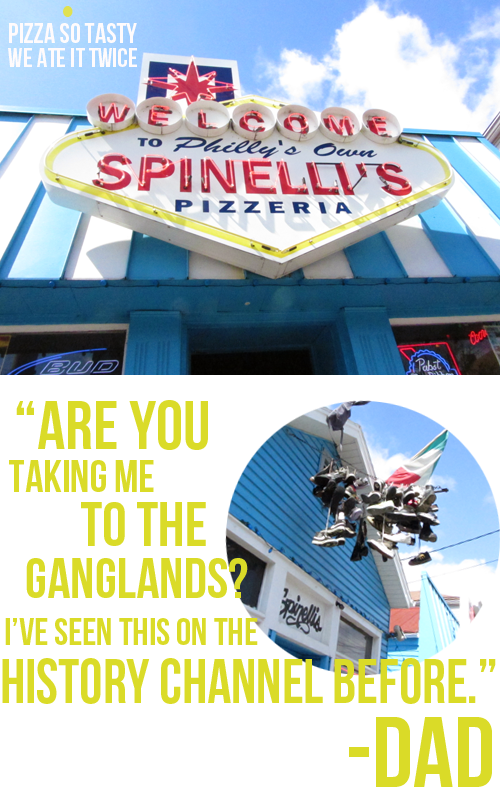 Everyone I asked said that there was only one place to go for some “effing great pizza man”. Everyone except our cab driver, who said it was too late for food. Too bad for him our hotel receptionist had our backs and gave us a menu for that “oh my gosh you are gonna love this pizza” place and their number. I called and ordered some pizza and soda pop, then my mom yelled at me for not ordering fried Oreos. I thought I was being healthy by avoiding the fried dessert at 3 a.m. but Mr. Spinelli thought otherwise. Miracle of all miracles, they gave us fried Oreos. 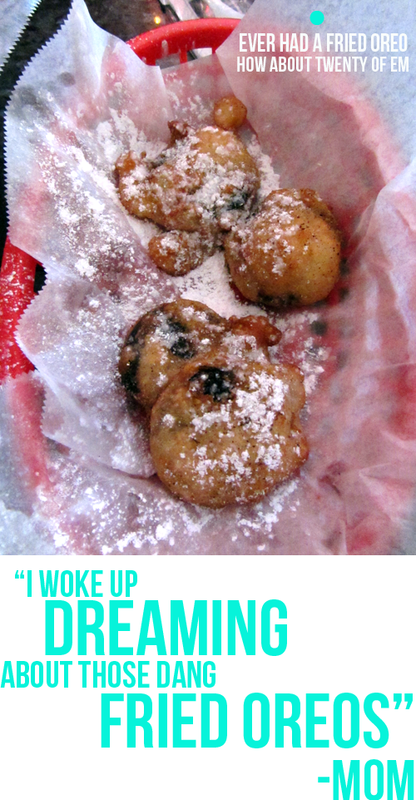 Let me tell you, fried Oreos after three buckets of beer is better than heaven. 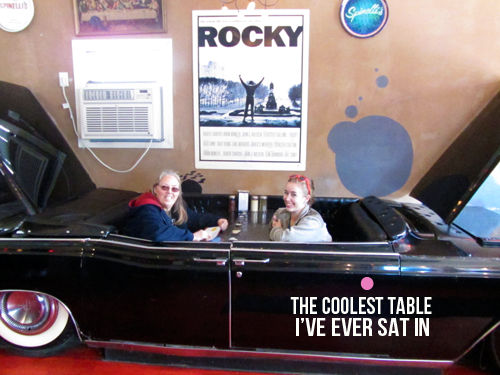 So the next day, we did the only reasonable thing…got seconds. If you are local to Louisville, I am jealous. 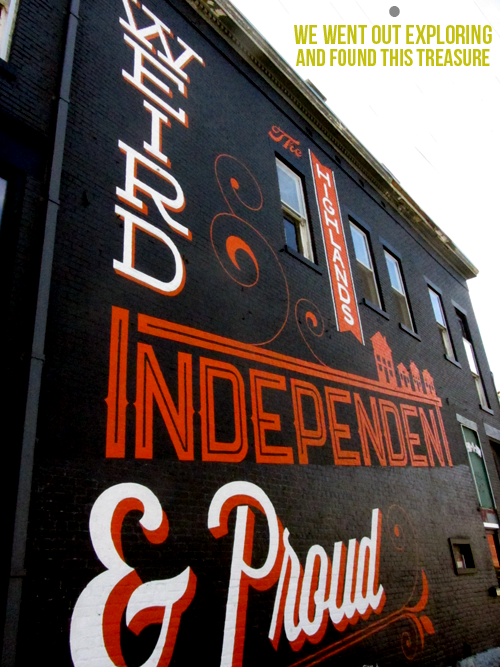 If you are traveling to Louisville, go there and I’m jealous. If you have no plans to go to Louisville, make them. After lunch we explored a little and found eclectic little homes and shops. This was my favorite. What is your favorite “family vacation” memory? Ever been to Louisville, KY? Want to be a gypsy like Stevie Nicks?